The Montebello Police Department is seeking the public’s assistance in locating a Felony Hit and Run suspect and vehicle – responsible for the death of Steven Vasquez Garcia, who was 24 years old at the time of the collision. Mr. Garcia was a resident of Montebello. 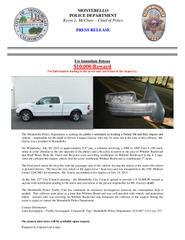 On Wednesday, July 08, 2015 at approximately 9:57 pm, a collision involving a 2000 to 2005 Ford F-150 truck, white in color (Similar to the one depicted in the photo) and a bicyclist occurred in the area of Whittier Boulevard and Bluff Road. Both the Truck and Bicyclist were travelling westbound on Whittier Boulevard in the # 2 lane. After the collision the suspect vehicle fled the scene westbound Whittier Boulevard to southbound 3rd street. The Ford truck struck the bicyclist with the passenger side of the vehicle, leaving the mirror at the scene (the mirror is pictured above). The bicyclist was struck in the upper torso / head area and was transported to the USC Medical Center (USCMC) for treatment. Mr. Garcia succumbed to his injuries on July 10, 2015. At the July 22nd City Council meeting - the Montebello City Council agreed to provide a $ 10,000.00 reward to anyone with information leading to the arrest and conviction of the person responsible for Mr. Garcia’s death. The Montebello Police Traffic Unit has conducted an extensive investigation; however the communities help is needed. This collision took place at a time that Whittier Boulevard was well-traveled with vehicle and pedestrian traffic. Anyone who was traveling on Whittier Boulevard and witnessed the collision or the suspect fleeing the scene is urged to contact the Montebello Police Department. Lead Investigator – Traffic Investigator, Corporal R. Yap / Montebello Police Department (323) 887 -1212 ext. 337. On camera interviews will be available upon request.